It helps to have a tangible reference point when talking about degrees minutes and seconds. If you plan journey using degrees minutes and seconds these are the real world parameters. About 4-5 days walking at a typical speed on roads. About 20 minutes of time walking at a typical speed on roads. 20 to 30 seconds of time walking. The size of a large house. I did try to compare this distance to a football/soccer field. but even that is not standardized, if the most widely played sport has no standardized field size, it explains why we are in the mess we are currently in. Posted in Educational, Map, Navigation, Transportation. For almost everything else the Metric system is the best system to use, it’s widely used in the world like the way English is understood. The Metric system is extensively integrated into science and engineering. However in Navigation based on extremely old standards (people have been making maps for as long as there have been kings) inherited from the Sumerian civilization. When we talk about degrees° minutes’ and seconds” they are commonly refereed to as degrees of an arc, minutes of an arc or seconds of an arc. The basic idea is that 1 minute (of an arc) is 1 nautical mile. Note the current standard American nautical mile is 6080.2 feet. So because these standards are locked together an have huge historical legacy it worth learning them. The idea that 1 minute of an arc is 1 nautical mile helps bring real world scale to something as abstract as 1/60 of 1 degree on a compass. 99.93% of the modern accepted value. For example if you found a pirate treasure map, you can be sure its is distances are measured in nautical miles. Sadly even nautical miles had local variants due to local variants in what was a mile. Nautical mile are also 1% shorter at the poles as the earth is an oblate sphere ( a sphere with smaller diameter at the poles). Being more specific the compass points to align itself the strongest magnetic field, which may or may not be grid north, usually not. 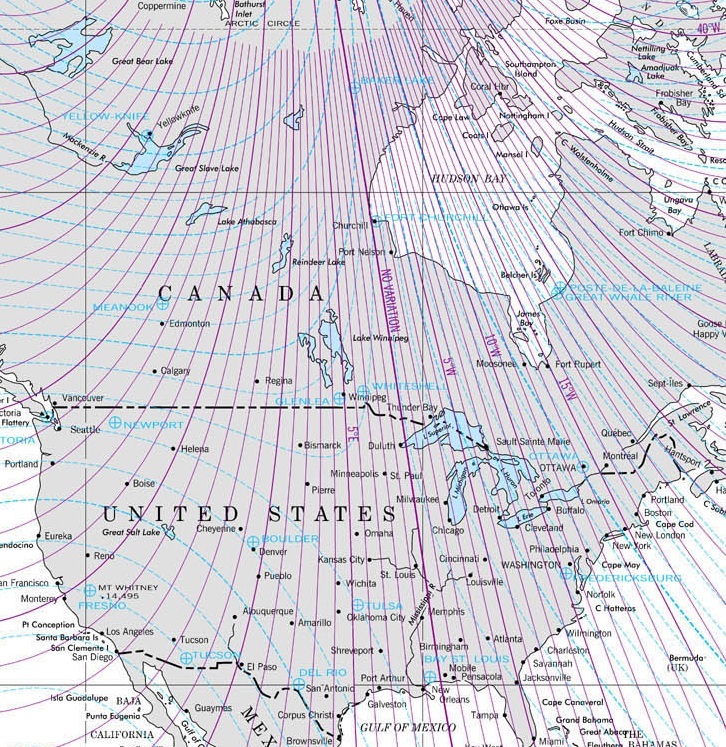 The north pole where all the lines of the map grid connect, sadly is not the magnet north pole, the same is true for the south pole. The south pole is not even under Antarctica, it is not even covered in permanent ice, its just off the coast of Antarctica in the southern ocean. With the right ship you could sail to the magnetic south pole. So because of this you will need to add a correction factor (magnetic declination) based on exactly where you are on the earth (and years since map printed). This will show you how much you compass be away from grid north when pointing to magnetic north and whether magnet north will be to the east or west of grid north. 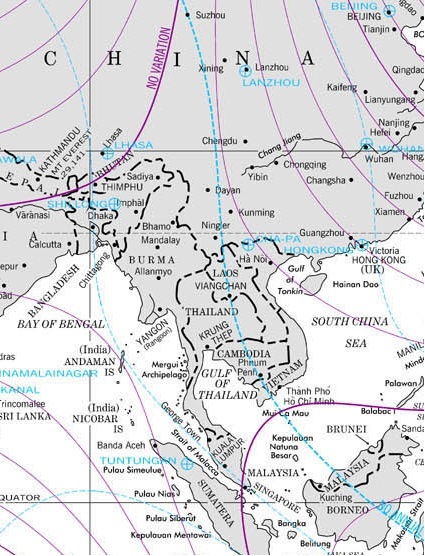 in the area of former French Indochina Vietnam Cambodia, Laos and Thailand there is very little magnetic variation, less than 1 degree, so in that area grid north and magnetic north are almost identical. In the east the declination is to the west and in the west the declination is to the east. 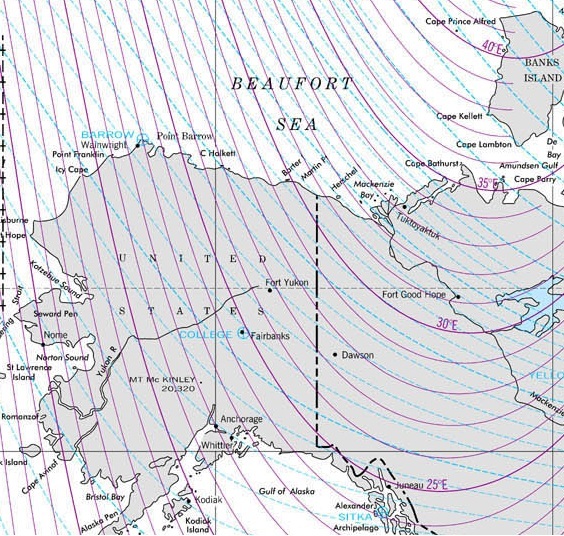 The declination becomes extreme in the Alaska and western Canada areas. 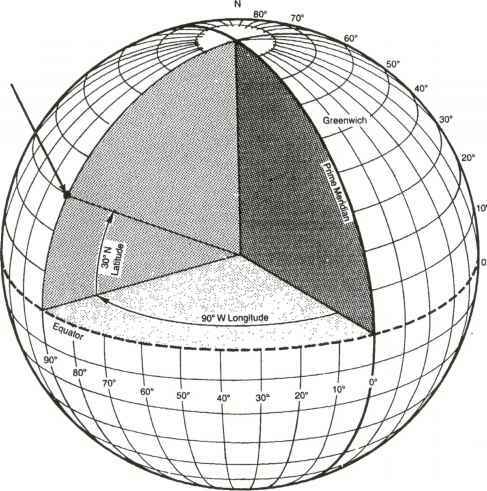 Here the declination becomes quite significant, in Banks island the declination is around 40 degrees, being that the difference between East and North-East is 45 degrees, you would not want to get this wrong. 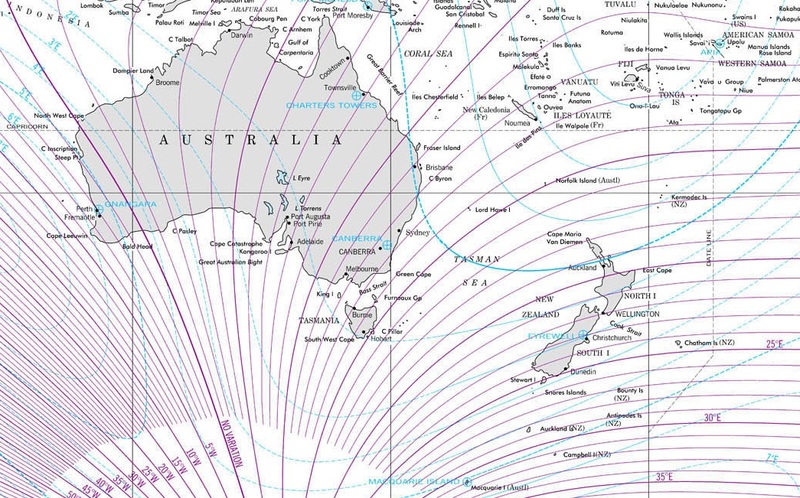 Magnetic declination Australia and New Zealand. The declination problem is as extreme as the case for North America, the real issue especially for Australia is the magnetic anomalies. You might recall that Australia is (in many places) simply made from iron ore, and iron is magnetic. 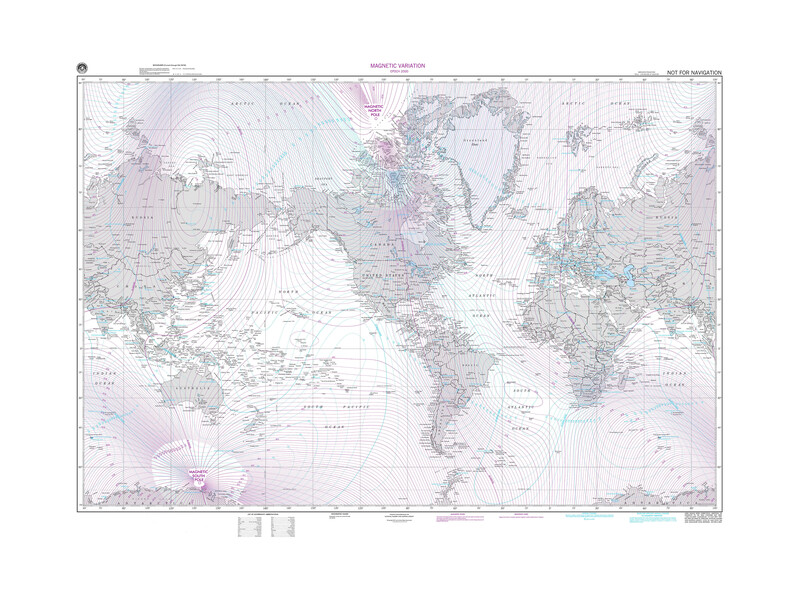 Magnetic declination (and the location of the magnetic poles) changes with time. The measurements of change are in the above charts as light blue lines and are in the units of minutes per year ( 1 minute being 1/60 of a degree). 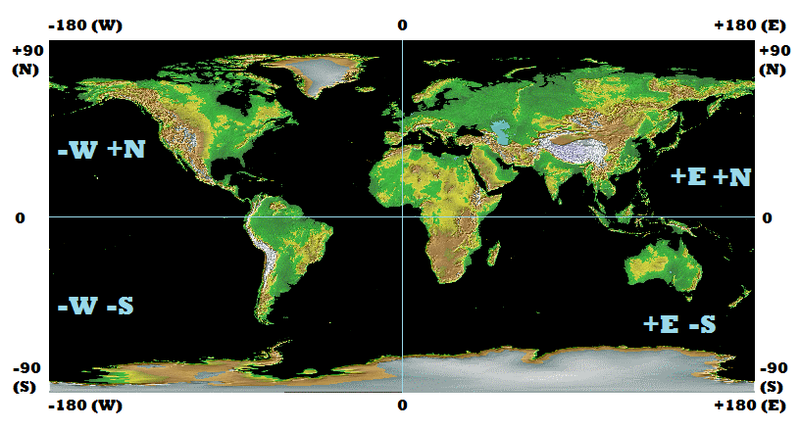 Here is an animation of the slow changes in declination over a 400 year period from the USGS. Please note the most recent data on the animation is from 1990 as i write this its 22 years out of date so the charts from 2001 are more accurate. degree. Change to declination due to shifts in the earths magnetic field are measured in minutes per year and just like declination itself, it is dependent on the position you are on the planet. If you’re wondering where this numerical system came from, it came from Sumer, the first known civilization. While it seems like an awkward system at first, it is worth understanding, as it is completely embedded in geography, cartography navigation, astronomy and the measurement of time. Long after Sumerian was a dead language, scholars were studying Sumerian cuneiform to understand Sumerian knowledge of astronomy and cartography; all described in base 60: degrees, minutes and seconds. Once a workable standard gets established, it gains considerable momentum. For simplicity of mathematics we will arbitrarily assign east to positive declination and west to negative declination. As north is considered to be 0 or 360 degrees on a compass this will make sence, 15 degrees east is +15 degrees 20 degrees west is 340 degrees (360 -20). Just like on a clock at midday it is 12 and the next hour is 1 and the previous hour is 11. In 2001 declination was 11.5 E; which is 11 degrees 30 minutes E.
Change in declination was 0.75 minutes per year E; which is 0 minutes 45 seconds. This is the same as saying how many minutes have passes in 11 45 second time periods. Time passed since map drawn was 11 years. How many degrees and minutes is this? 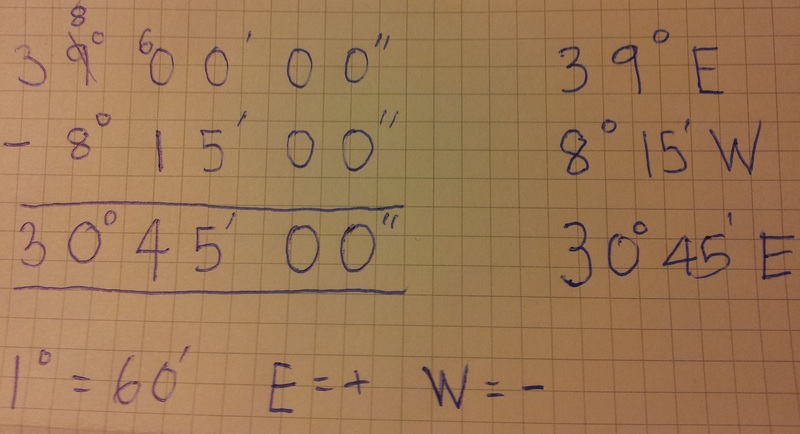 Interestingly the math was identical as before but the magnitude is 60 times larger. So now that I have explained all of this and not even shown a picture of a compass you may be wondering about my logic. Navigation by compass is not a simple affair, well not as simple as it appears once declination and declination change is taken into account. Traveling on featureless terrain, desert, tundra, steeps, prairie, ocean. Attempting to triangulate your position from landmarks. Making decisions based on precise measurement of where north or south is, such as a sundial orientation or solar panel placement. Using a very old map. In a location with large annual declination change ( Canada, eh ). Learn the parameters of your tools. There is nothing worse than having too much faith in a tool you really don’t understand the subtleties of. I will add that in trying to explain all of this, which was 24 hours of research and writing, I learned a lot. I hope you have learned a lot too. You’ll never think about North the same way again. Even so unless I’m on the ocean, I say the map is far more important than the compass. Posted in Educational, Magnetic, Map, Navigation, Transportation.